You can choose one or more alternatives when you want to invest in gold. Many investors include gold or gold-related funds in their portfolios as a hedge against inflation, currency devaluation and general economic chaos. If you are trying to decide how to incorporate gold into your investments, you can choose from several alternatives that each have their pros and cons. 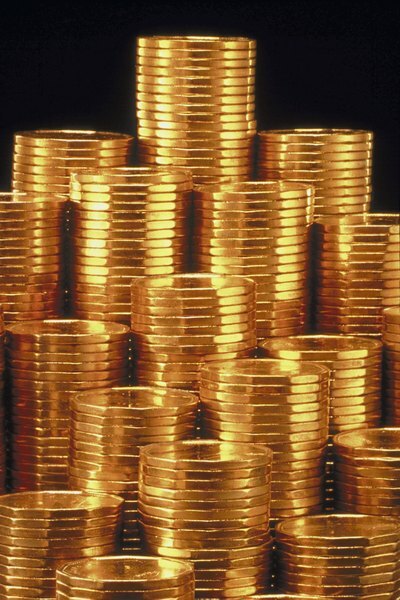 You can purchase investment gold in the form of bullion and coins. If you are concerned about economic turmoil, you might gain comfort from owning gold. In an emergency, you might be able to exchange gold for the necessities of life. On the downside, gold pays no interest or dividends, and you must sell it if you want to generate cash. You must provide for storage, which may involve additional costs such as a safe or space rental at a secured depository. You might also want to assay and insure your gold. The Commodity Futures Trading Commission recommends you check out metals brokers carefully before buying to avoid frauds looking to scam you. You might benefit from a little comparison-shopping to avoid paying too steep a dealer markup. A physical gold exchange-traded fund is stock backed by a stockpile of gold. The fund company buys gold and then sells a fixed number of shares through an initial public offering. The shares you own represent your portion of the gold. While the ETF does not normally generate any capital gains, you may do so by selling your shares. For shares you hold for a year or less, the Internal Revenue Service will tax any gain at your marginal rate. For long-term capital gains, as of 2013 you'll pay your marginal rate up to a maximum of 28 percent. You will have to pay the ETF's annual fees for management, storage and insurance. An indexed gold ETF doesn't hold gold at all. Instead, it maintains a portfolio of futures and options on gold. Its aim is to deliver the same percentage return as that provided by the index. The ETF will always underperform the index because of fees. The ETF must realize all capital gains by year-end. The IRS treats 60 percent of capital gains as long term and 40 percent as short term, whether the gains stem from the ETF portfolio or the sale of shares. You pay your marginal rate on short-term gains. The long-term capital gains rate for individuals with modified adjusted gross income exceeding $400,000 is 20 percent. This also applies to couples with MAGI greater than $450,000. Otherwise, your tax is 15 percent if you are in a 25 percent or higher bracket, and 0 percent for lower brackets. The gold you own doesn't create taxable income until you sell it. That's a plus as long as you don't need income from your investment. Assuming you hold the gold for more than a year, its sale can create a tax bite of up to 28 percent, as of 2013. An indexed gold ETF creates annual capital gains and losses that track the performance of a gold index. You might receive taxable income, although the 60/40 rule might lower your tax bill. You can hold certain types of physical gold as well as a gold index ETF in an individual retirement account to postpone or avoid taxes. While a gold index ETF might provide returns that match the price fluctuations of the metal, owning gold outright might afford you a unique form of tangible confidence. The New York Times: How About a Fort Knox of Your Own?